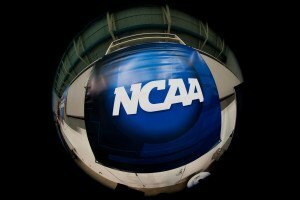 On day 2 of the SEC tri-meet featuring Mizzou, Arkansas, and Kentucky, the Wildcats swept the women’s meet, and beat Mizzou in the men’s meet. Arkansas also topped Mizzou by 1 point in the women’s meet. Arkansas took both the women’s relays, the 200 medley relay and 400 free relay. Arkansas continued to post times that were nearly fastest than their best times from last season. Andrea Sansores led off the 200 medley in 26.12, followed by Sydney Angell (28.22), Kobie Melton (24.90), and Anna Hopkin (21.73), finishing in 1:40.97. Hopkin’s free split was the fastest in the field by over a second. Arkansas was 1:40.05 at their fastest last year, which they swam at the SECs. In the 400 free relay, Arkansas posted the 5th fastest time in the nation this year – 3:19.64. That relay was led off by Melton in 50.57, then Kiera Michailoff-Russel swam a 50.28, followed by Hopkin with a blistering fast 47.77, and anchored bu Marlena Pigliacampi in 51.02. Arkansas’ fastest 400 free relay last year was 3:19.19. Hopkin continued to post very impressive times on day 2. She broke another Arkansas school record, this time in the 50 free. Hopkin swam a 22.25, marking a season best by .04 seconds. She also posted a 54.59 to claim 3rd in the 100 fly. Ann Ochitwa won the 100 fly in a season best 53.90, while Asia Seidt came in 2nd, tying her season best of 53.94. 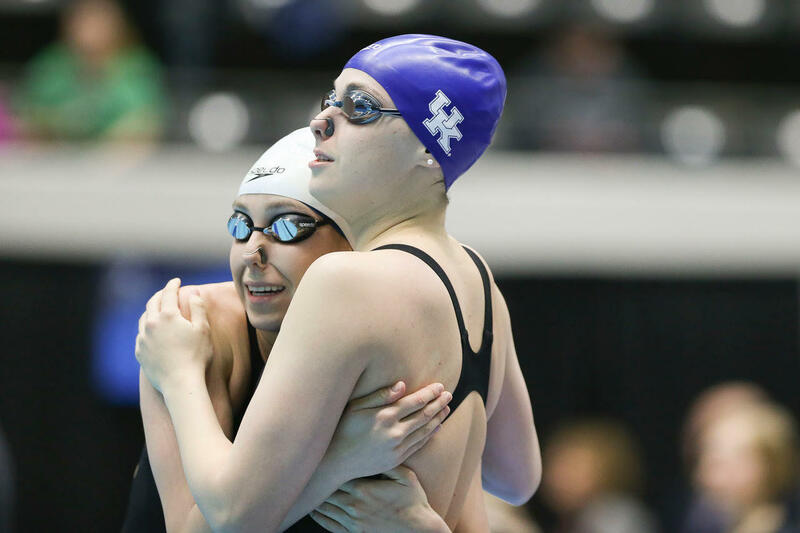 Kentucky freshman Riley Gaines posted a season best 1:48.84 to hold off senior teammate Geena Freriks (1:48.95) in the 200 free. Kentucky’s Bailey Bonnett blasted an SEC-leading 2:12.22 to win the women’s 200 breast. She was in a league of her own, splitting 1:03.95/1:08.27 at the 100s. She also posted a 4:17.41 in the 400 IM, running away with the race on the back of a speedy 1:09.68 breaststroke split. Arkansas’ Brooke Schultz continued to dominate in women’s diving, taking the 1 meter by over 30 points with a score of 306.15. Kentucky’s men kicked off the 2nd day with a win in the 200 medley relay, thanks in large part to a 19.74 anchor from Peter Wetzlar. The Wildcats touched in 1:28.95 to Mizzou’s 1:29.09. Wetzlar went on to lead a 1-2 charge for Kentucky in the men’s 50 free. He swam a 20.04, beating out teammate Jason Head (20.36). Mizzou’s Daniel Hein took the men’s 100 back with a 48.26, marking a .26 second improvement for Hein over this point last season. Mizzou freshman Jack Dahlgren posted a 1:37.99 to win the 200 free. Dahlgren boastst a personal best of 1:35.39, marking a quick porformance for the 18-year-old. Micah Slaton led the way in a 1-2-3 punch for Mizzou in the 100 fly. Slaton posted a 47.94, narrowly out-touching freshman teammate Danny Kovac (48.09), and Hein (48.35). The men’s meet ended in exciting fashion, with Mizzou hitting the last leg of the 400 free relay .28 seconds ahead of Kentucky. Kentucky’s Glen Brown then threw down a 43.55 to hein’s 44.55, getting Kentucky the win at 2:56.51 to Mizzou’s 2:57.23. COLUMBIA, Mo. – Taking full advantage of its two-day meet on the road, the Kentucky swimming and diving program accounted for each win possible on the tri-meet ballot in Columbia, Missouri, leaving the men and women with three-meet winning streaks ahead of an all-important Ohio State Invitational. The No. 18 Kentucky women recorded two satisfying wins over Missouri (210-143) and No. 23 Arkansas (206-147), while the men posted a last-race victory that sealed the deal over No. 22 Missouri (184-167). Both squads led after the first day, generating enough momentum to finish victoriously on Friday. “It was a great day for the Wildcats,” said head coach Lars Jorgensen. 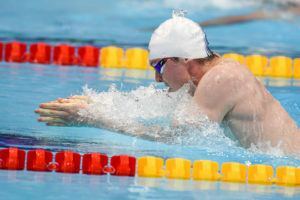 “It was a really exciting men’s meet, coming down to the very last relay. It was a team effort across the board. Peter Wetzlar was awesome, also Jarod Kehl winning the 1,000 freestyle. We won the medley relay in the beginning too, which kept the momentum going throughout the day. Again, a lot of people came out today. The 400 IM swimmers were fantastic. Daniel Orcutt and Connor Blandford were 1-2 in that, and that made a difference giving us a little cushion on the last relay. The two-day meet, 38-event format, was contested in the Mizzou Aquatic Center Nov. 1-2. It marked the third meet on the Kentucky schedule. A host of gold finishes were had by Wildcats in the two-day stretch. The UK women and men saw 11 winning finishes each, of 19 events per squad. The UK women posted 10 individual victories and one relay victory. The men saw nine individual wins, with two relay wins recorded in the 200-yard medley relay and the 400-yard freestyle relay, which finalized the meet. Junior Asia Seidt put together the most individual wins in the tri meet, with four defeats – 200-yard backstroke, 200-yard individual medley, 200-yard butterfly, and 100-yard backstroke. The Kentucky native’s time in the 200-yard butterfly (1:58.99) will allow her to move into the ninth spot in the discipline, in Kentucky’s record book. She shed .29 milliseconds off her previously recorded time, which filed a No. 10 ranking. The Kentucky swimming and diving program will head north Nov. 15-17 for the annual Ohio State Invitational, an event Kentucky looks forward to each year for its competitive atmosphere and record-breaking results by Wildcats. COLUMBIA, Mo.- The No. 23 Arkansas swimming and diving team split competition at the Missouri tri-meet, defeating Missouri 177-176 and falling to No. 18 Kentucky 206-147. Junior Anna Hopkin set her second record in as many days, her third record-breaking performance of the year. The Hogs won four events and had nine podium finishes, bringing the two-day total to seven wins and 15 podium finishes. Arkansas started the day off strong, once again winning the opening relay. Andrea Sansores, Sydney Angell, Kobie Melton, and Hopkin set a season-best time in the 200 yard medley relay (1:40.97) victory. The Razorbacks won the other relay event of the day, with Melton, Kiera Michailoff-Russell, Hopkin, and Marlena Pigliacampi setting a season-best time in the 400 yard freestyle relay (3:19.64). Peyton Palsha earned two second-place finishes, with a time of 10:06.85 in the 1000 yard freestyle and a time of 4:23.03 in the 400 yard IM. Hopkin earned one first-place finish and one third-place finish in individual events, setting the school record in the 50 yard freestyle (22.25). The Hogs earned two podium finishes in the 200 yard breaststroke, with Vanessa Herrmann earning second place (2:17.46) and Angell earning third place (2:17.63). Sophomore Brooke Schultz won the 1m springboard with a score of 306.15 to sweep both diving events. Arkansas will return to the pool after a week off, traveling to Austin, Texas for the Texas Diving Invite and back to Columbia, Mo. for the Missouri Invite. COLUMBIA, Mo. – The Mizzou men’s and women’s swimming and diving teams completed competition in a two-day meet against Kentucky and Arkansas (women only) on Friday morning at the Mizzou Aquatic Center. The outcome came down to the final races of the day, with the Arkansas women squeaking past the Mizzou women, 177-176. The Wildcat men defeated the Tiger men, 184-167, and the Kentucky women notched a 210-143 win over the Mizzou women. A total of five Tigers took home wins during day two action on Friday. In the diving well, senior Kyle Goodwin (Aurora, Colo.). completed a sweep of the springboards as he took first on 3-meter with 346.35 points. The senior also won 1-meter during Thursday competition. Junior Micah Slaton (Austin, Texas) led a 1-2-3 finish for the Mizzou men in the 100 fly to help the team pick up valuable points in the race. Slaton dropped a 47.94, a time that ranks 16th nationally, to earn top honors in the event. Freshman Danny Kovac (Fort Collins, Colo.) was second in 48.09 and junior Daniel Hein (Sycamore, Ill.) placed third in 48.35. All three times were season-bests. Hein picked up an event win of his own in the 100 back, as he touched in 48.26, also a season-best time. In the 200 free, freshman Jack Dahlgren (Victoria, Minn.) claimed his first collegiate win as he took first in 1:37.99. The freshman also placed third in the 100 back in 49.17. The Tigers are idle until the three-day Mizzou Invite, which runs Thursday, Nov. 15-Saturday, Nov. 17. Preliminary action begins at 10 a.m. each day, with finals at 6 p.m.
She’ll win the 50 free this year, you heard it here first. Arkansas is beyond lucky to have landed such an outstanding talent with Hopkin, she is changing the program!